c.1980? | age 12? Another unfinished page, which I’m publishing as an ‘inbetween-updates-bonus-update’. 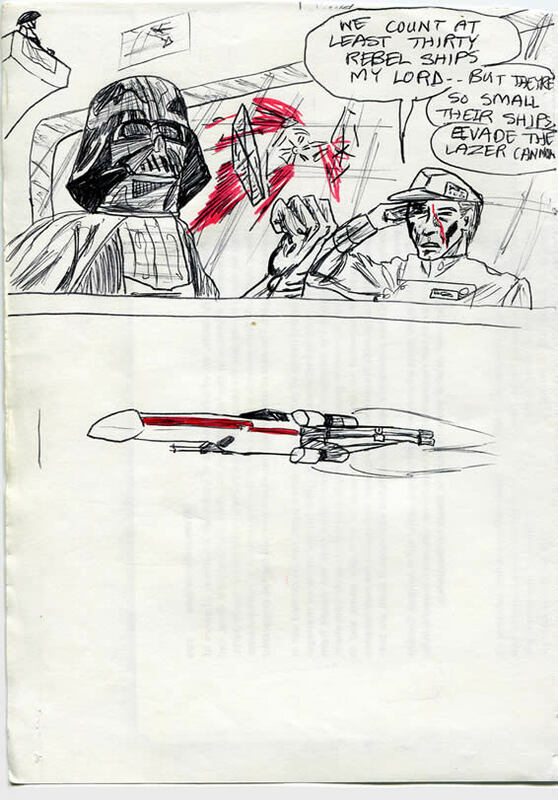 Vader’s getting pretty pissed off in this one. It’s time for him to get more hands-on I think! It is so hard to put dates on many of these pages. Maybe I was even 14 or 15 when I did this, just so hard to say. But it’s very difficult. I’ve never been very good at detective work and big-wide-ranging-analysis. I can’t seem to hold it all in my head and see the connections. Concentrating on one thing at a time is more my thing. It’s further proof that I never should have worked in the headwrecking world of I.T. with all of its code and complex systems! I like the bonus content more, especially the Tie fighter blowing up just outside of vader’s window, and the lone X wing. How did you know to draw bonus content for your strip, so many years before the internet? Interesting question Tom. Quite amazing. Wormholes again?